In honor of National Nutrition Month, our dietitians are sharing tasty, healthy, and low-cost recipes that focus on limiting food waste. In our recent nutrition education class, “Get Creative with Leftovers,” our dietitians demonstrated how one dish of roasted vegetables can be prepared into two quick weeknight dinners. 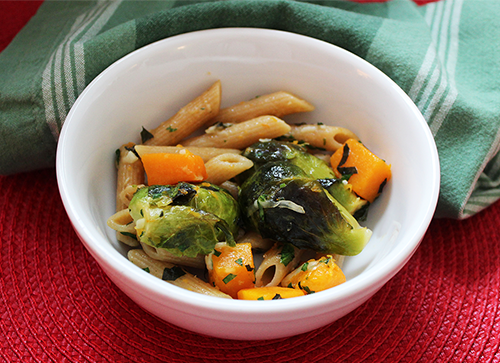 In one recipe, roasted vegetables and whole-wheat noodles combine to make a hearty but healthy vegetarian pasta dish. You can vary the vegetables and the cheese selections to make endless combinations. The next night, add black beans to your leftover vegetables and make tacos! Preheat oven to 425 degrees. Toss squash and brussel sprouts with 2 tablespoons olive oil and salt. Place on a sheet pan. Roast until tender and starting to brown, about 20 minutes. Bring a large pot of water to a boil. Cook pasta according to package directions. Drain pasta, reserving one cup of the pasta cooking water. Heat a large skillet over medium heat. Add garlic and sauté for one minute. Add drained pasta and roasted vegetables. Add the Parmesan cheese and about half of the cooking water and stir until the water evaporates a bit and everything is combined. If the sauce looks grainy or dry, add more cooking liquid until it comes together. Top with chopped herbs and pepper. Serve hot.